The Community Services Preventive Task Force, an independent, nonfederal, unpaid body, appointed by the Director of the Centers for Disease Control and Prevention (CDC), recommends smoke-free policies based on sufficient evidence of effectiveness in reducing tobacco use among workers. To help organizations maximize this opportunity to help smokers quit, the California Smokers' Helpline is offering a free Smoke-Free Policies and Cessation Kit. 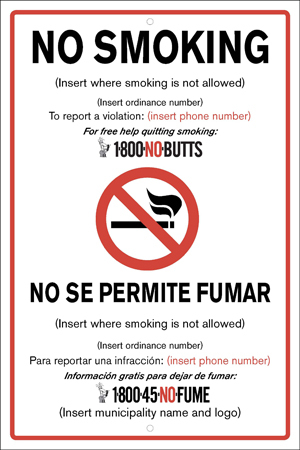 The Kit includes a Smoke-Free Policies and Cessation fact sheet, step by step guides for developing, implementing, and enforcing smoke-free polices at hospitals and community health facilities, and order information for customized NO SMOKING outdoor stickers and signs that feature 1-800-NO-BUTTS. Click here to download your free Kit now!